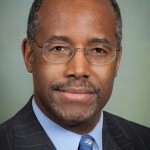 I am thrilled to nominate Dr. Ben Carson as our next Secretary of the U.S. Department of Housing and Urban Development. 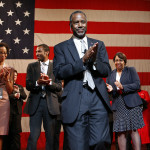 Ben Carson has a brilliant mind and is passionate about strengthening communities and families within those communities. We have talked at length about my urban renewal agenda and our message of economic revival, very much including our inner cities. Ben shares my optimism about the future of our country and is part of ensuring that this is a Presidency representing all Americans. He is a tough competitor and never gives up. I am honored to accept the opportunity to serve our country in the Trump administration. I feel that I can make a significant contribution particularly by strengthening communities that are most in need. We have much work to do in enhancing every aspect of our nation and ensuring that our nation’s housing needs are met. Trump tweets that he is considering Carson as head of the Department of Housing & Urban Development. During a joint appearance at Trump’s Mar-a-Lago Club resort Palm Beach, Florida, Carson formally endorses the GOP frontrunner. We buried the hatchet. That was political stuff…I have found in talking with him, that there’s a lot more alignment, philosophically and spiritually, than I ever thought that there was. Trump says Carson has not asked for any formal role, and praises his former rival’s ideas on education. Ben’s going to have a big, big part. Well, you know there are two Donald Trumps. There’s the Donald Trump that you see on television and who gets out in front of big audiences, and there’s the Donald Trump behind the scenes. They’re not the same person. One’s very much an entertainer, and one is actually a thinking individual. We’re talking about ruthless things tonight. Carpet bombing, toughness, war, and people wonder, could you do that? Could you order airstrikes that would kill innocent children, not scores but hundreds and thousands. Could you wage war as a commander in chief? Well, interestingly enough, you should see the eyes of some of those children when I say to them, We’re going to have to open your head up and take out this tumor. They’re not happy about it, believe me. And they don’t like me very much at that point. But later on, they love me. Sometimes you—I sound like him. Later—you know, later on, you know, they really realize what’s going on. And by the same token, you have to be able to look at the big picture and understand that it’s actually merciful if you go ahead and finish the job, rather than death by a thousand pricks. Trump tells a rally in Fort Dodge, IA, that those who support Carson are “stupid” to believe the “crap” that is his life story. At one point, Trump walks away from the podium and flipped his belt buckle up and down to ridicule what Carson has described as a key event in his life: that Carson, as a boy, once tried but failed to stab someone only to have the knife broken by a belt buckle. So I have a belt: Somebody hits me with a belt, it’s going in because the belt moves this way. It moves this way, it moves that way. He hit the belt buckle. Anybody have a knife? Want to try it on me? Believe me, it ain’t gonna work. You’re going to be successful, but he took the knife and went like this and he plunged it into the belt and, amazing, the belt stayed totally flat and the knife broke…How stupid are the people of Iowa? How stupid are the people of the country to believe this crap? Now that he’s completed his gratuitous attack, why don’t we press on and deal with the real issues. That’s what the people of America are concerned about, not so much politics as usual, politics of personal destruction — that’s what the American people are sick and tired of…It’s not the kind of dialogue that I would ever engage in and I’m hopeful that his advisers will help him to understand the word pathological and know that that does not connote incurable. It simply describes something that is highly abnormal and something that fortunately I’ve been able to be delivered from for half a century now. Carson’s campaign releases a rap radio ad, called Freedom, that will run in African-American populations in Miami, Atlanta, Birmingham, Jackson, Memphis, Little Rock, Houston and Detroit. In the ad, a rap by Aspiring Mogul is overlaid with clips of Carson speaking, as the music urges listeners to “vote, vote.” The campaign is spending $150,000 on the promotion. I’m very hopeful that I’m not the only one who’s willing to pick up the baton of freedom, because freedom is not free and we must fight for it every day. Every one of us must fight for it because we’re fighting for our children and the next generation. Carson comments on his 1998 Andrews University commencement speech where he said that his personal theory is that Joseph built the pyramids to store grain. It’s still my belief, yes…the pyramids were made in a way that they had hermetically sealed compartments….You would need that if you were trying to preserve grain for a long period of time. Now all the archeologists think that they were made for the pharaohs’ graves. But, you know, it would have to be something awfully big if you stop and think about it. And I don’t think it’d just disappear over the course of time to store that much grain…And various of scientists have said, ‘Well, you know there were alien beings that came down and they have special knowledge and that’s how–‘ you know, it doesn’t require an alien being when God is with you. We also think there are too many debates. They’re all bunched up and they really do take a lot of time away from the campaign and they take a lot of financial resources for us to be able to work on them. I believe our Constitution protects everyone… They (the gay community) shouldn’t automatically assume because you believe that marriage is between one man and one woman, that you’re a homophobe. This is one of the myths that the Left perpetrates on our society. This is how they frighten people and get people to shut up. You know, that’s what the PC culture is all about, and it’s destroying this nation. According to a CBS News/New York Times national poll, Carson leads Trump 26 percent to 22 percent among likely Republican voters. Carson’s four-point lead is within the survey’s margin of error. Since August, when the same poll gave Carson 6%, his numbers have quadrupled. The rest of the GOP field is far behind. Far behind are Rubio (8%), Bush (7%) and Fiorina (7%). All other candidates are at 4% or less. 70% of Republican primary voters say they have not decided which candidate they will support. People realized we got the short end of the stick when the Democrats had a 2 minute opening and a 90 second closing [during their debate], so they had three and a half minutes to a 15 million person audience of an infomercial. They get a commercial, we get The Hunger Games. During an interview with Todd on Meet The Press, Carson says he would not support a Muslim being president. Todd: Should your faith matter to voters. 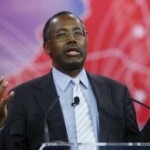 Carson: I guess it depends on what that faith is. If that faith is inconsistent with the values and principles of America then of course it should matter. But if it fits within the realm of America and is consistent with the constitution, then no problem. Todd: So do you believe that Islam is consistent with the Constitution? Carson: No I do not. I would not advocate that we put a Muslim in charge of this nation. I absolutely would not agree with that. Todd: Would you ever consider voting for a Muslim for Congress? In an interview with Cuomo on CNN, Trump criticizes Carson’s medical experience. He makes [Jeb Bush] look like the Energizer Bunny…But Ben Carson, you look at this faith and I don’t think you are going to find so much. And you look at his views on abortion, which were horrendous…Who is he to criticize me on my faith? He was a doctor, perhaps an okay doctor, by the way. You can check that out too. He was an okay doctor, and now because he’s a doctor and he hired one nurse he’s going to be end up being the president of the United States? After the resignation of four staffers and articles claiming his campaign is in “turmoil,” Carson issues a statement claiming someone is purposely undermining his campaign. I thought it was ridiculous, obviously someone is making an attempt to sabotage. I don’t know who this is, but there’s no truth to it whatsoever. I talked to my campaign and they said things are going as well as possible. Every campaign goes through growing pains as it puts together a leadership team that has to work together and live together through the trying times of a presidential election. Despite his own surge in popularity that makes him a strong candidate for the first Republican debate, Carson asks the RNC to allow all candidates to participate. I am very worried that out of broadcasting convenience our party is about to exclude voices from our debate programs that are critical to making our party bigger, better, and bolder. The rules may be good for me personally, but they are not good for the process. We are blessed to have so many qualified candidates running for president, more than a typical debate format can handle. Surely we could find a format to allow every voice to be heard. Carson raises concerns over polling requirement for GOP candidates to participate in Fox News presidential debate. He also asks Republican National Committee for a solution that is inclusive of every voice. I am writing you today about an issue that concerns me greatly…I am very worried that out of broadcasting convenience our party is about to exclude voices from our debate programs that are critical to making our party bigger, better, and bolder…The rules may be good for me personally, but they are not good for the process. We are blessed to have many qualified candidates running for President. More than a typical debate format can handle. Surely we can find a format that allows every voice to be heard. Carson’s business office continued scheduling paid speaking engagements through January 2015. Carson is set to give an unspecified number of paid speeches extending into next fall. During an interview on Fox News, Carson says he is launching an exploratory panel to determine if there is enough support to make it feasible for him to run for president. He says he has already hired around twelve people to conduct focus groups and polling. The committee will be based in Alexandria, VA.
We are officially launching our exploratory committee. That means we have put in motion the staffing and the mechanism to explore to see whether me running for President in 2016 is a viable thing…We have tremendous popular support. The money will be there if the people want me to do this. There is no war on [women], the war is on their babies. Babies that cannot defend themselves. Over the past few decades, we have destroyed 55 million of them. And we have the nerve to call other societies of the past heathen. What we need to do is re-educate the women to understand that they are the defenders of these babies. K is for knowledge, which is the thing that makes you into a more valuable person. Things don’t mean anything. It’s knowledge that allows you to be able to acquire things, it allows you to be able to move to the place that you want to move to, and to accomplish the things that you want to do. That is really why Solomon, the wisest man who ever lived, talked so glowingly about what knowledge can do for a person. 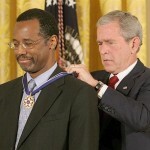 THINK BIG: FULL VIDEO – Ben Carson, M.D. Carson switches parties, changing from Independent back to Republican on Election Day and files paperwork in his new home state of Florida. It’s truly a pragmatic move because I have to run in one party or another. If you run as an independent, you only risk splitting the electorate. I clearly would not be welcome in the Democratic Party, and so that only leaves one party. Fortunately, the fit is pretty good. I believe in reasonable sized government. I believe in personal responsibility. I believe in individual freedom. And I believe in creating an environment to let free markets grow our economy. And all of that is very consistent with being a Republican. In an article for Townhall.com, Carson says he believes that affirmative action helped provide him with opportunities he otherwise would miss. I believe that I benefited from affirmative action. When I applied to Yale University, I thought my chances of being accepted were favorable only because I was somewhat naive about admissions requirements for a high-powered Ivy League institution. In my mind, I was pretty hot stuff. Only after I got to Yale and became cognizant of my classmates’ many accomplishments did I realize that the admissions committee had taken a substantial risk on me and that I had been extended special consideration. My early academic experiences were traumatic, and but for the grace of God, I would have flunked out. Such a strategy demonstrates sensitivity and compassion, as well as recognition of substantial achievement in the face of difficult obstacles. The groups who benefit from compassionate action will probably change over time, depending on which ones have the greatest number of obstacles to overcome. The point is, it’s time to be more concerned about the content of character than the color of skin when extending extra consideration. Many people saying goodbye; securing and giving things to people. One last patient visit and, at the end of day, a speaking engagement, which is now my new life. Dr. Carson has served the children of East Baltimore for many years. We are incredibly fortunate that he has now agreed to lend his time, expertise and energy to the students, parents and educators of the Henderson-Hopkins school. His talents will be a boon to the school, which itself is a keystone to the success of East Baltimore Development Inc.
Carson returns to his Alma mater, Yale, to meet with the five 2012 Carson Scholars, who excel based on their academic excellence and humanitarian qualities. It’s always great to be back particularly at a time like this when we can honor those young people who worked so very hard to achieve this distinction Anybody who can win one of these can do virtually anything. 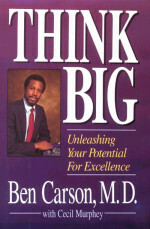 In Think Big, Carson gives his personal formula for success, which he basis on his own life developing from an inner city ghetto kid to a world famous neurosurgeon. He spells out his philosophy which he believes will improve quality of life through easily remembered points based on the letters that spell out the title. It does not matter where we come from or what we look like. If we recognize our abilities, are willing to learn and to use what we know in helping others, we will always have a place in the world. I am humbled by President Bush’s recognition of my work. I am extremely grateful that he chose to honor me not only for my work as a neurosurgeon, but also for my efforts to improve the lives of America’s youth. I am blessed to have the opportunity to pursue both paths, which I consider equally important. I thank President Bush for the honor of an invitation to serve on this important council. As discovery and technology move science and medicine rapidly forward, I look forward to participating in meaningful dialogues on the ethics of applying this new knowledge to care for humankind. Carson is one of the surgeons on the team that attempts the first separation of conjoined twins joined at the skull. Neither twin survives. The women certainly understood the risks and were determined to proceed. I felt compelled to get involved to help give them their best chance at survival and separation, and I have no regrets over my decision. No act is a failure if you learn from it. 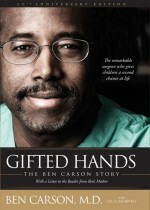 Carson publishes an autobiography entitled, Gifted Hands, telling the story of his life as a disadvantaged inner city youth through when he becomes Director of Pediatric Neurosurgery at Johns Hopkins University Hospital. My major hope is that the message . . . will be seen by millions and millions of young people who might begin to recognize that they actually play a very major role in what happens to them in terms of the decisions that they make, regardless of the environment that they’re growing up in. Carson heads team that separates seven-month-old twins joined at the back of the head in a 22-hour operation. This is the first time this type of surgery is successful and Carson is cautiously optimistic. We did everything humanly possible to bring this off.. Right now, they are in stable but critical condition. The rest of it is up to God. It will be days before doctors will have any sense of whether either boy will recover and live a normal life. Benjamin Solomon Carson is born in Detroit, Michigan, to Sonya and Robert Solomon Carson, a Seventh-day Adventist minister. His parents come from rural Georgia. He is their second son. Carson’s mother raises her two boys on her own, supporting the family with two or more cleaning jobs at a time. Carson attends Durfee Elementary School. I not only saw and felt the difference my mother made in my life, I am still living out that difference as a man.